I love reviews written by people who write for a living (or at least a major hobby). They raise points from a perspective of someone who looks at a metric ton of games, and if they've been reviewing for a while, you can get an easy idea of how their tastes match up with yours by reading their archive. "If you want a quick game for playing in lines that's fun as hell, never gets boring and portable and easy to learn, I can't stress [Zombie Dice] enough." 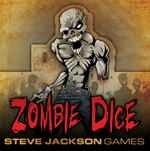 "I had Zombie Dice and Cthulhu Dice on me as well, since they are quick and fun games." "[Zombie Dice] was what I saw most of at last PAX Prime." "Some variant of Fluxx, Zombie Dice, Cthulhu Dice and Uno will probably be my go-to's for Prime." These recommendations are pure heart-warming gold. To every one of these posters -- and to anyone who has recommended our games to their friends -- we say "Thank you!"